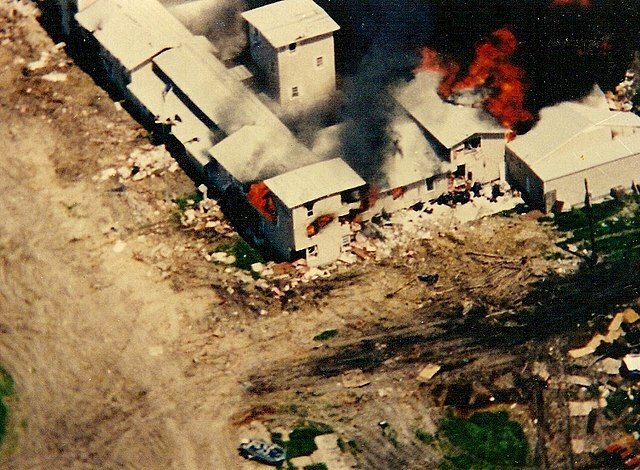 (Wikimedia Commons/Federal Bureau of investigation)FBI photo of Waco siege. A new television series covering the 1993 shootout between federal government agents and the Branch Davidians spiritual sect will start filming this month in New Mexico. The series, titled "Waco," will be exploring the details leading up to and chronicling the 51-day standoff that led to the deaths four federal agents along with some 70 people in the sect's compound, The Associated Press reported. The Branch Davidians, a breakaway sect from the Seventh Day Adventists, was led by David Koresh, whom the authorities are trying to arrest on weapons charges. When agents with the Bureau of Alcohol, Tobacco, Firearms and Explosives tried to serve a search warrant on the Branch Davidian compound in Waco, Texas in late February 1993 for the stockpiles of weapons and explosives, they were greeted by the sect members with gunfire. Investigator later determined that the sect had been tipped off about the raid. During the standoff, federal authorities expressed concern for the children in the compound as Koresh has been known to have multiple wives, including preteen girls. After the FBI negotiator asked Koresh to lead the sect members out, military vehicles began ramming the buildings and spraying teargas. Fire spread through the compound a few hours later, with only nine people escaping the siege that ended on April 19. Officials with the New Mexico Film Office say that the series will be the first time the standoff is told on television through the perspective of people intimately involved on both sides of the conflict. The filming locations will include urban office buildings and studios as well as the rural reaches of Santa Fe County, which would stand in for the prairies of Central Texas. Work on the six-part series will begin in mid-April and last through June. The cast includes Michael Shannon, Taylor Kitsch, and John Leguizamo, who will be playing ATF agent Robert Rodriguez. The series, which will premiere on the Paramount Network in 2018, will be directed by John Erick Dowdle and produced by The Weinstein Co.
"The Weinstein Co. is known for high quality projects with intriguing story lines and 'Waco' is no exception," said State Film Office Director Nick Maniatis. The dramatic siege has been viewed by millions on live television and has been the subject of several documentaries and books. Network officials, who initially announced the project last year, said that the miniseries would change the way the event would be viewed.